Ensure that your organization is getting the best possible forecasts, as efficiently as possible. 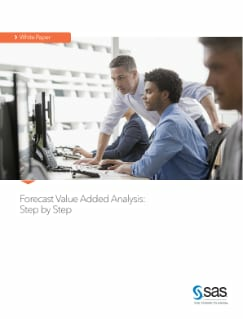 Through this paper you will discover how the forecast value added (FVA) metric can be used to identify waste in forecasting processes and expose factors that diminish accuracy. The author provides detailed instruction on using FVA: from gathering data, to conducting analysis, to effectively reporting the results to management. He also discusses the real-world results of FVA analysis at companies from a variety of industries.